Electric cars are breaking records in California—and demand remains high. Two hundred thousand plug-in vehicles and counting. The most electric models available in the country. State policies that incentivize electric vehicles, and a public that’s hungry for more. 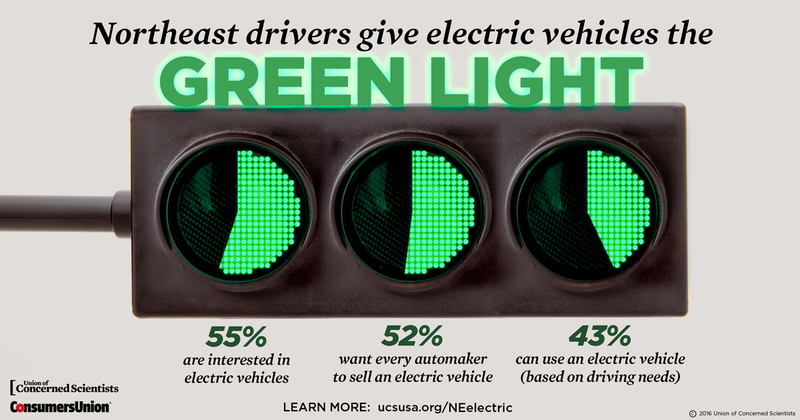 That’s the story of electric cars in California, and it’s a story reinforced by an April 2016 survey conducted by the Union of Concerned Scientists and Consumers Union. Our findings were clear: though California is already a leader in adopting electric cars, the potential market for plug-in vehicles remains huge—and there’s more to be done. A forthcoming analysis by the Union of Concerned Scientists also finds that electric cars are made available in Californian cities at rates exceeding those of Northeast cities—highlighting the popularity of electric cars in California, and reinforcing the need for automakers to market and sell their cars across the country. We surveyed drivers in the Northeast too! See the infographic. Live in California? Interested in electric cars? Check out some of these helpful resources. The survey was conducted among 1,213 randomly selected adults in California and 9 Northeast states who were licensed to drive and had driven a vehicle in the past 12 months. The survey was carried out from April 1 to April 8, 2016. The margin of error is 4 percentage points at a 95 percent confidence level for questions asked of all respondents.